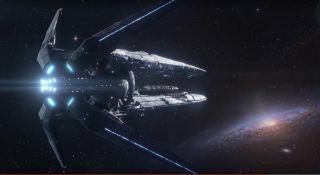 BioWare said earlier this week that N7 Day, its annual celebration of all things Mass Effect, would bring no "major" announcements about the upcoming Mass Effect: Andromeda. So far, it's holding true to that statement. But that doesn't mean it's got nothing. The N7 Day 2015 video is a look back at humanity's first tentative steps into space, and an exhortation to carry on into the darkness. It's pure hype—but holy cow, that Commander Shepard sign-off really got me good. You'll have to excuse me, I think I've got something in my eye. BioWare also posted a brief "Happy N7 Day" message on its blog, again more of a reminiscence than insight into the future of the series. "As we look back on the trilogy, we think of the many amazing things your enthusiasm has created," it says. "Your passion has formed friendships spanning the globe, brought people together, and inspired a new generation of gamers. It’s the reason you can walk down an unfamiliar street in a strange city, share a knowing nod with someone in an N7 hoodie, and feel at home." Mass Effect: Andromeda is slated to come out during the holiday season of 2016. Here's what we're hoping to see in it—How about you? Update: Not too long I put up this post, Mass Effect Producer Michael Gamble said something interesting on Twitter.